Cy’s stature as a solo and multiple pianist meant that his non-commercial recordings as accompanist tended not to be in the public performance context: there, his audience most often wished to hear Cy play piano alone, or in duo piano teams. However, some very rare, or unique, transcription discs of Cy performing as accompanist have survived. 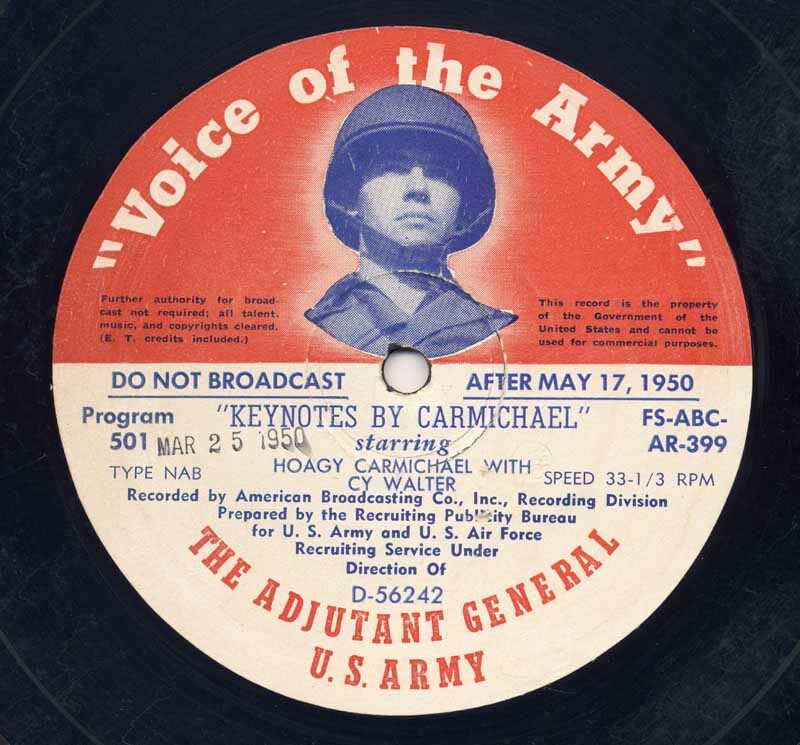 Pictured below is the disc issued to radio stations for the Voice Of The Army Hoagy Carmichael/Cy Walter collaboration on the Keynotes By Carmichael show; here Cy performed both solo and accompanist numbers with Hoagy, recorded in New York City’s Radio City Music Hall on 20 January 1950. 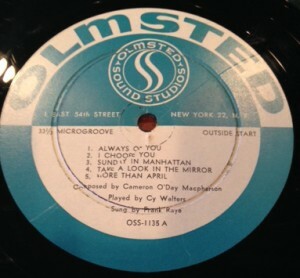 Also pictured is an unusual, privately-commissioned disc that Mark Walter obtained on Ebay some years back; it is on the Olmsted recording studios label and features songs composed by Cameron O’Day MacPherson and sung by Frank Raye. Speculation based upon this studio’s historic output pattern of other artists’ recordings and the Olmsted record label number leads to the conjecture that this disc was made around 1958. 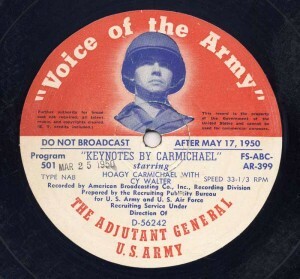 The Walter family also has in its collection some unique transcription discs, not pictured here, of Cy as accompanist with vocalists Fred Astaire (with Benny Goodman’s Orchestra, in which Cy is presumed to almost certainly have been a part in this instance as the 1947 recording is of Cy’s composition, The Astaire); Louise Carlyle; Larry Carr; Glenn Cross; Marlene Dietrich; Eileen Farrell, Bob Haymes, Christine Johnson; Jack Smith; and Frank Sinatra. There are also recordings of a couple of songs on which the vocal artist is not identified and whose identity has not yet been determined. 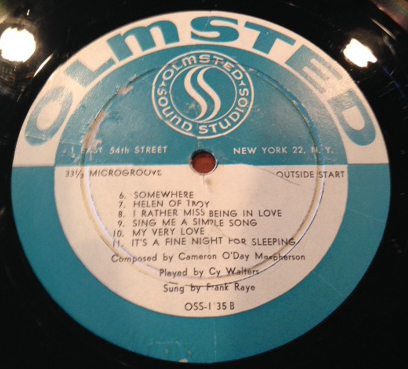 Some of these unique transcription discs are from radio programs, and others are apparently simply studio recordings. Collectively, they attest to Cy’s similarly-popular status as an accompanist amongst professional singers as that which he enjoyed as a pianist amongst New York’s sophisticated audiences.